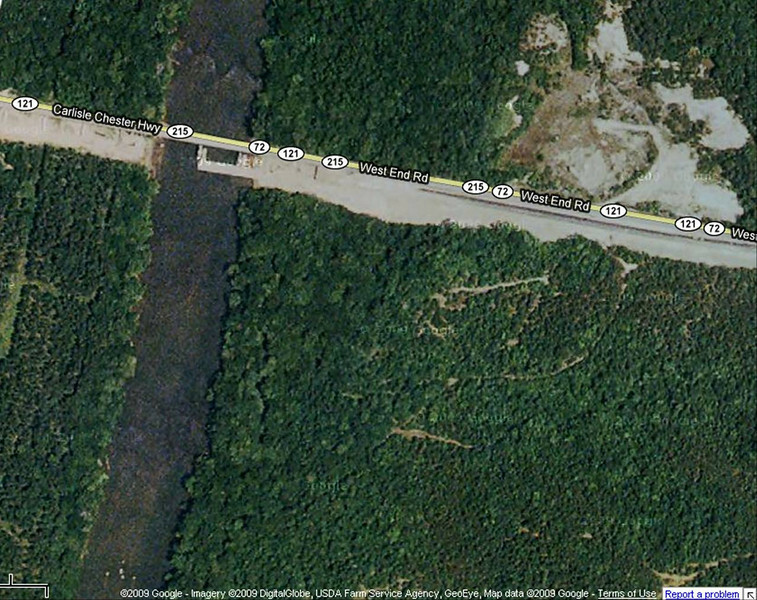 This satellite image of the project location shows the battlefield site, south of SC 72 and east of the Broad River. South Carolina Route 72 crosses the Broad River on a bridge near the Sumter National Forest. For travelers in the area, this is a critical piece of infrastructure because it is the only crossing available for 30 miles. In the early 2000s, the bridge was deemed functionally deficient, and a new site was chosen for a replacement bridge. Since the project was funded in part through federal highway funds, the action was subject to Section 106 of the National Historic Preservation Act of 1966, which requires review for impacts on historic properties and resolution to mitigate any adverse effects. As part of this review, a Revolutionary War battlefield previously believed destroyed by a quarrying operation was rediscovered. Typically, the Section 106 process would require archaeological excavation of the 30 acres of the 275 acre battlefield that were affected by the project. However, this would have left the remaining majority of the battlefield unexplored and unprotected, while raising the cost of the bridge replacement astronomically. Thus, Transportation Enhancement funds were used to acquire the entire battlefield instead, and the bridge was designed to cross adjacent to the newly protected area. The key partner that enabled this alternative mitigation was the South Carolina Department of Natural Resources, who agreed to manage the site post-acquisition.